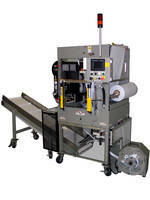 The 301-ID E-Commerce Bagger/Labeler is capable of producing bags with sizes ranging from 2 x 2 in. to 18 x 24 in. The unit is equipped with a Model 252 label printer applicator that features a touch screen user interface for easy programming. It eliminates the need for employees to handle bags or labels and minimizes film cost. The label printer comes with a rewind motor module, plasma coated air assist tube and a service position tamp module. The new Rennco 301-ID E-commerce Bagger/Labeler automatically forms an optimally sized shipping bag around groups of products arriving via tote at a packing station and, at the same time, prints and applies an address label for maximum packaging productivity. HOMER, Mich., October 5, 2018 – At up to 30 packages per minute, the new 301-ID E-commerce Bagger/Labeler from Rennco, a product brand of ProMach, provides distribution centers with an automated process for fast, cost-effective packing of mixed products going to a single address. The 301-ID eliminates the need for employees to handle bags or labels. Less manual handling means greater overall packing-line efficiency. A switch from packaging mixed-product orders in boxes to bags lowers Dimensional Weight (DIM) calculated shipping cost. Furthermore, the 301-ID minimizes film cost by forming optimally sized bags around each order. And, distribution centers can save as much as 50 percent on consumables by eliminating the need to purchase premade bags. The 301-ID produces bags as small as 2 x 2 inches to as large as 18 x 24 inches, and the bags can be used for shipping consumer or commercial products. As a tote arrives at the packing station, its bar code is scanned. Address data is then downloaded to the ID Technology Model 252 label printer applicator. (ID Technology is also a product brand of ProMach.) The employee transfers the products from the tote to the 301-ID and the automation does the rest. With a footprint of less than nine square feet, distribution centers can use these compact caster-mounted machines to increase the number of lines in their shipping facilities. The ID Technology Model 252 label printer applicator features a touch screen user interface for easy programming, a rewind motor “module” that is hot swappable, a revolutionary plasma coated air assist tube that eliminates label sticking, and many options, including a service position tamp module. Rennco manufactures vertical packaging L-sealing equipment and automated packaging systems. For more than 40 years, companies have depended on Rennco solutions to package a wide variety of products in polyethylene, polyolefin, and PVC bags. Rennco is a market leader in delivering innovative, reliable, cost-effective solutions for fully automated, semi-automatic, and hand-loaded bagging operations. All Rennco products are designed and manufactured in Homer, Michigan. For more information about Rennco, visit www.Rennco.com.